Are you able to post a picture? I would also ask what the off-roading conditions were. like this exactly and offroad is only rocks ,what i am asking is if i can make some kind of guards? Is it being bent by impact loads? 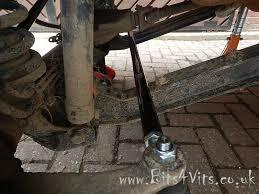 If your rod is bending due to high loading in rough terrain, I would defer to S200KYS experience with the Trail-Gear HD Steering kit. On the other hand, you have obviously had the problem more than once and you mentioned driving over rocks and asked about a guard. That is why I asked if the bending was due to impact load. If it is due to impact caused by the front of your Jimny coming over an obstacle and the rod coming down on a rock, the heavy duty kit may not solve the problem. I'm not sure how you would design a guard to go under the rod that would really provide reasonable protection from that kind of damage. Are you able to clarify the cause of the bending? If it has been bent once, it will go soft in that spot and bend more easily next time. Hardened steel can be more brittle and is not always the right way to go. Harder is not always stronger for this kind of use, steel can have all sorts of specs. Steel with bigger diameter is often good, but if the steel bar have been peeled in production after forging as many tool steels for hardening is, it will be poorer to withstand bending forces as the forging make it strongest in the outer parts and more soft in the center of the diameter. Thanks for the feedback S200KYS. It's good to know for future reference. My career was working as an engineer for a company that designed and fabricated military vehicles. One of the things we would sometimes be faced with is redesigning a part that was failing in the field. It would be easy to just make the part stronger but then you just shift stresses to another component in the subsystem. I have wondered if the HD steering kits would do that ultimately causing other components to see excessive stresses.